New research has found that hypervelocity planets may be flung to the outer reaches of the galaxy by black holes at speeds matched only by subatomic particles, traveling at 1.5 to 30 million miles per hour. The finding builds on previous work on hypervelocity stars, which appear when a binary star system — two stars orbiting a central point — enter the gravitational well of a black hole, similar to the one at the center of our Milky Way galaxy. The black hole tears the stars apart, sending one of the stars hurtling from the galaxy at very high speeds while the other remains within the gravitational field of the black hole. Harvard's Avi Loeb, chair of the Harvard astronomy department, surmised that such planets could be seen through a telescope as “transits,” or traces, as they crossed a star’s light. He subsequently launched his collaboration with Dartmouth's Ginsburg to examine the possibility of such planets’ existence. “Once we realized that, it was clear to me that we could make a paper out of this,” Loeb said.Ginsburg and Loeb continued their collaborative research following Ginsburg’s move to Dartmouth to continue his studies. They developed computer simulations to explore the existence of hypervelocity planets, using facilities at both institutions, according to Ginsburg. The simulations placed the planets orbiting the binary stars in a binary planet system. When subjected to the same pressures that form hypervelocity stars, the models revealed that the planets would be similarly ejected at high speeds, Ginsburg said. The planets would travel toward the outer reaches of the galaxy and beyond at 1.5 to four times the speed of hypervelocity stars, potentially making them the fastest moving objects other than subatomic particles. The image at top of the page by the Hubble Space Telescope shows the active galactic nucleus of the Circinus Galaxy, where matter glows brightly before likely spiraling into a massive black hole. 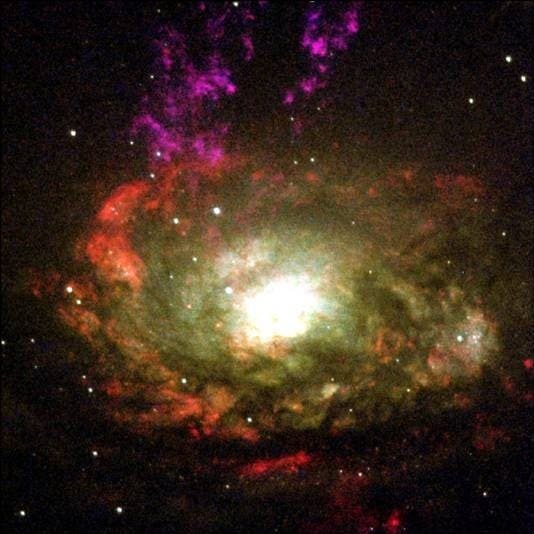 Although only 15 million light years distant, the Circinus Galaxy went unnoticed until 25 years ago because it is so obscured by material in the plane of the Milky Way.